Around a hundred of the men, women and children have broken away from the original site, where they were being penned in by riot police, and have now moved to a new blockade site down on the main Murum highway. 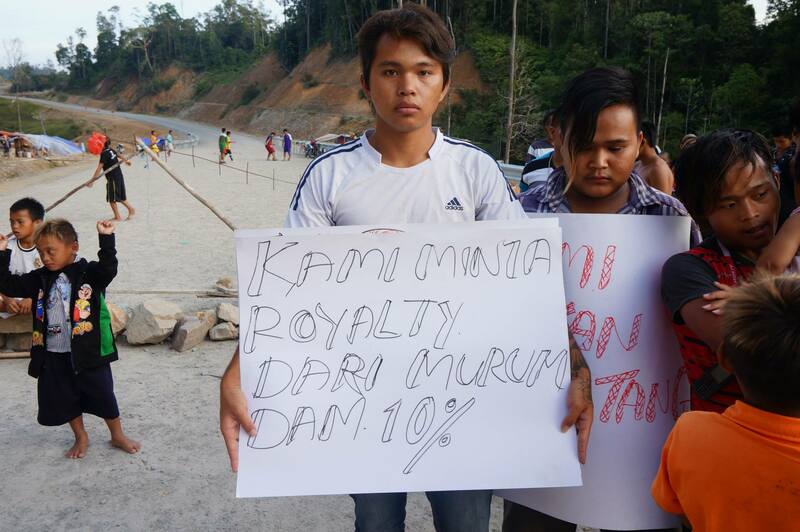 This position cuts across all roads leading to and from the site, including side roads and link roads that Sarawak Energy had been using to sidestep the original protest, in order to access the head of the dam and their various construction sites. 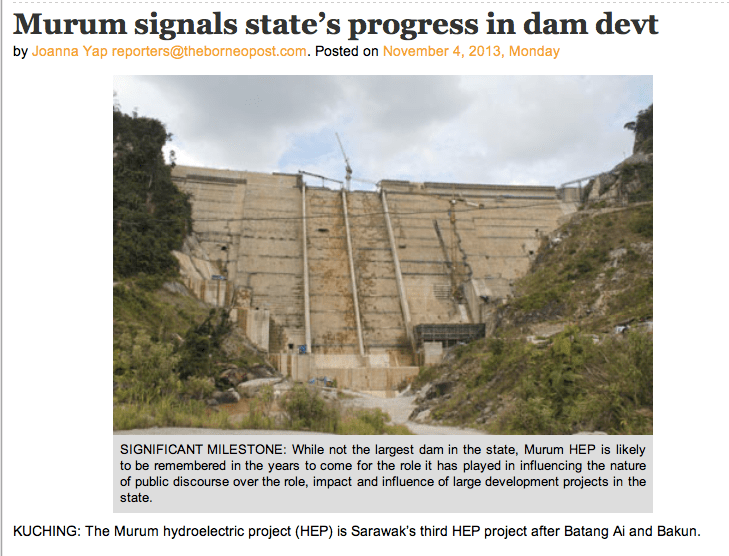 In the course of the day the new blockade is reported to have stopped all traffic going into the dam site, including cement lorries and Sarawak Energy (SEB) vehicles. “This will bring a critical situation within a few days, because the Penan are now stopping any vehicles belonging to SEB and building materials and cement to the powerhouse, which is still under construction. Other areas at the dam head are also not completed, even though SEB has given the orders to start inundating the dam. Within 10 hours all the cement that is at the construction site will have been used up. Lorries are bringing supplies in from Bintulu using this Murum Road. 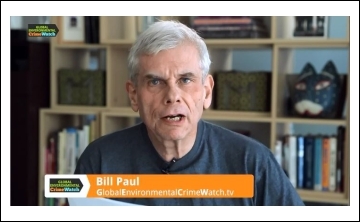 These are now being stopped.”[Brimas spokesperson]. 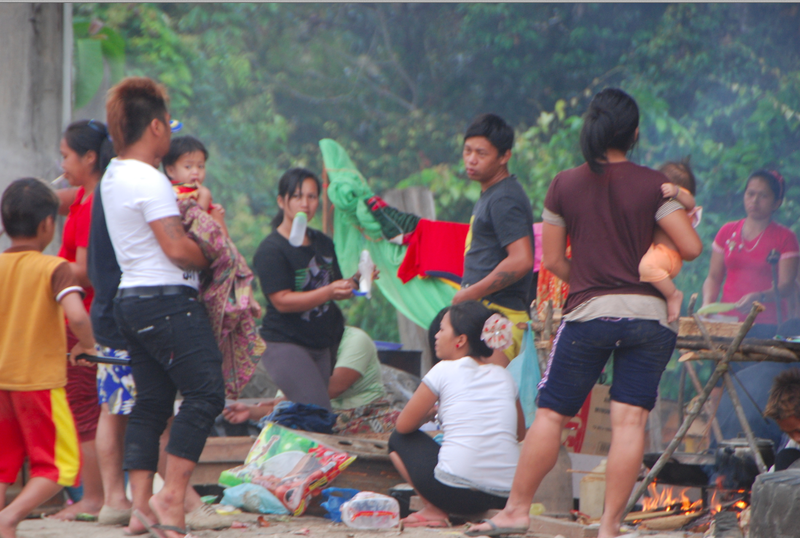 SEB claimed to journalists there were no Kenyah or Penan blockades at Murum! 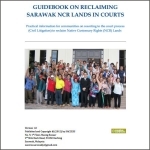 The development comes after an astonishing propaganda move by Sarawak Energy at the end of last month, at the same time that company bosses were over at the United Nations in Geneva claiming that Sarawak was “adopting best practice” over its corporate social responsibility and the environment. 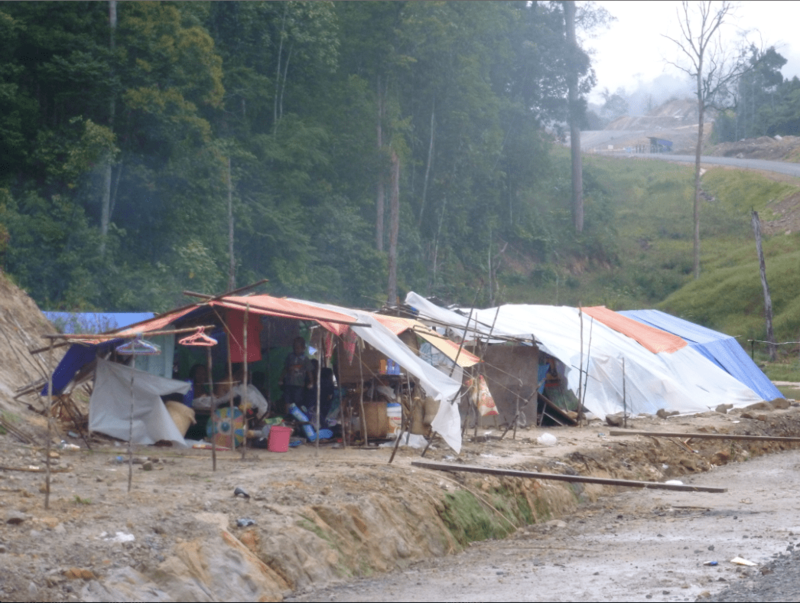 Sarawak Report has also learnt that throughout the trip the journalists were told by the SEB minders that there were no Penan or Kenyah blockades at the Murum site. This information was a lie. In fact the journalists were carefully driven round the protestors, who by this time had been sandwiched between two counter-blockades of armed police. The reporters were transported in a massive armed convoy that restricted their ability to report much beyond what was in the mass of paperwork that SEB handed the journalists at the end of the trip. So much for the company weeping crocodile tears at the United Nations about how it has struggled to uplift and support the indigenous people being washed from their homelands? Reports duly appeared which made no mention of the blockades by the indigenous local people. The developments at Murum come amidst an expression of growing concerns on the part of international NGOs over the welfare of these communities, which have been manning the open air blockades for many weeks. A delegation who managed to smuggle food to the families last week said that poor water supplies and the limited shelter from rain and sun had caused a number of stomach upsets and fevers in the camp, where there are many young children. One benefit of the new site is that there is a cleaner stream near by. However, NGOs are concerned that it is by a hazardous main road. The blockaders are asking for medicines and their food supplies are only sufficient for a few more days. Sarawak Report has contributed (using earlier donations) to supporting new efforts to bring medicines and fresh food to the site. “Up to now the police handling of the blockaders has been a heavy armed presence, but their manner has been relaxed”, explained one NGO, who visited the Penan on Saturday. ”But if SEB cannot continue with their construction work this may change. 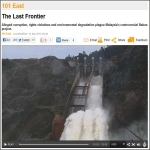 It seems very irresponsible of the company to have started the inundation of the dam without having fully completed its construction or even the construction of the power house”. 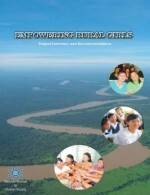 The NGO International Rivers say they are increasingly concerned about the situation in Murum and the welfare of the Penan and Kenyah. They are coordinating a statement from several NGOs to be published shortly. 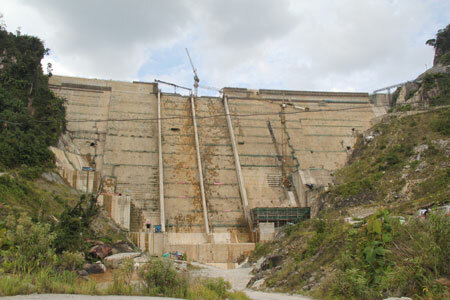 Why is SEB starts the impounding process when the Dam is not completed? 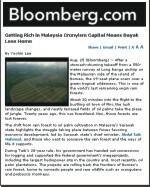 Journalists working for BN friendly news papers are absolutely bias in their reporting. 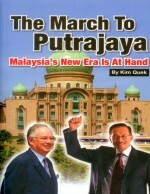 What they report are definitely the BN version and that is of course only half truths and out right lies! These are ” cari makan” reporters. Whenever you speak to them they seemed to be so tight lips or have nothng to comment but they were full of praises for the government and ignoring its misdeeds in their reportings. YES Peter, you are right! We shouldn’t call them JOURNALIST AT ALL BECAUSE THEY ARE MERE REPORTERS WHOSE JOB IS TO REPORT ONLY WHAT THEY ARTE ASKED TO REPORT to CARI MAKAN? But then again, they are given BREAK FAST to give them the energy before they start their hard work of being driven in luxury vehicles to locations where they will see what they are suppose to see only and thereafter write some “spiced up” stories on what they have been prepared and pre programmed to see and report on. JOURNALIST? NON can be found in SARAWAK lah! 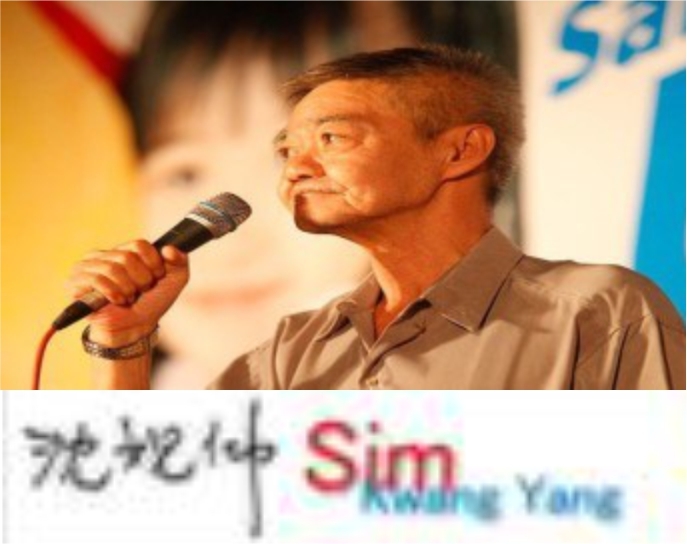 Sarawak journalists are generally very profesional in doing heir work but we cannot dismiss the fact that a few of them could easily be fixed with monetary incentive to cover the truth and pen a possitive image for the authority.